The Jetway Cardigan is one of those fantastic wardrobe-building pieces that you’ll wear forever; its timeless style will never fade. Cassie Castillo used all of her best design skills on this one! She combined texture and classic cardigan shaping to make a cozy, chic sweater. The texture comes in the form of striking two-stitch cables, which are a fantastic focal point on the Jetway Cardigan. There are also pockets—hooray!—to make Jetway seriously practical. The neckline is a flattering modified shawl collar, shaped with short-rows. Featured in the Spring 2019 issue of knitscene, Jetway is part of our travel story, which features projects that are great for wearing to faraway (or near!) 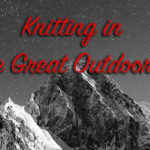 locations, as well as patterns to knit while traveling. We know knitters take their knitting everywhere they go, and we want to make sure you have the perfect project to take on vacation, and that you look great while you’re there! The Jetway Cardigan fits the bill. Finished Size 38½ (42, 46¼ , 50¼ , 53¾, 58)” circumference at underarm, buttoned. Cardigan shown measures 38½ “; modeled with 1½ ” of positive ease. YarnThe Yarn Collective Hudson Worsted (85% merino wool, 15% yak; 196 yd [180 m]/3½ oz [100 g]): #407 Olana ochre, 8 (9, 10, 10, 11, 12) skeins. Yarn distributed by LoveKnitting. Needles Size 6 (4 mm): Two 32″ circulars (cir) and set of double-pointed (dpn). Size 7 (4.5 mm): 32″ cir and set of dpn. Adjust needle size if necessary to obtain the correct gauge. (cn); stitch holders; six 1″ buttons; tapestry needle. Gauge 23 sts and 28 rnds = 4″ in Diamond patt on larger needle. 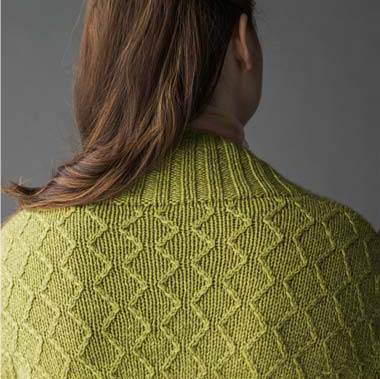 Check out the other designs in knitscene Spring 2019, all inspired by travel, air, and adventure. The Jetway Cardigan is just one of many travel-worthy patterns! All images courtesy of Harper Point Photography. Love this cardigan and love seeing your name on the story, Kathleen! I am delighted by the amount of pattern and the style of the collar.